DATE_COMPUTE_DAY Returns a number indicating what day of the week the date falls on. Monday is returned as a 1, Tuesday as 2, etc. DATE_IN_FUTURE Calculate a date N days in the future. MONTH_PLUS_DETERMINE Add or subtract months from a date. To subtract a month, enter a negative value for the 'months' parameter. HOLIDAY_GET Provides a table of all the holidays based upon a Factory Calendar &/ Holiday Calendar. date is a holiday by checking the parameter HOLIDAY_FOUND. write: / ld_date, 'is a holiday'. write: / ld_date, 'is not a holiday, or there was an error calling the function'. 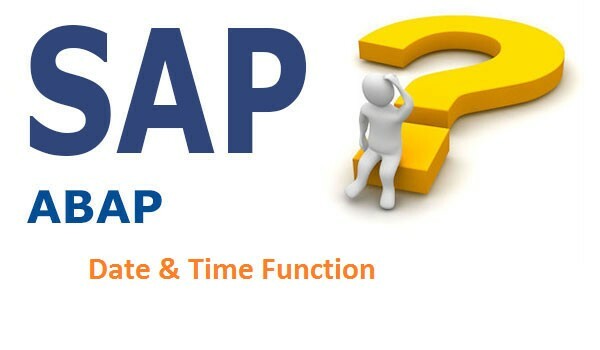 DATE_CHECK_PLAUSIBILITY Check to see if a date is in a valid format for SAP. Works well when validating dates being passed in from other systems. MONTH_NAMES_GET It returns all the month and names in respective language.